The most epic terrain vehicle journey ever. That’s what this is. Basically, I implemented simple controls for moving the terrain vehicle and then worked on the mechanics of how the wheels move. The wheels display suspension and steering and acceleration. The body of the terrain vehicle adjusts accordingly to the angles between the center of the T.V. and the front and rear wheels. I took an approximately 15-minute video of a nice “stroll” through the planet in the first orbit in the Arth star system. I start out at the higher elevations where there are mountains and snow and ice. Then I meander down towards the valley where there are canyons. Then I head towards the beach where there’s beautiful water glistening with wind-blown waves. I then drive around the lake and head up into some more mountains. I then shed a tear because it was all so beautiful. The video does show one unexpected oddity – the T.V. itself drives on water at the correct height, but the rendered terrain drops below the T.V. according to the sea bed height. Oops. I know what went wrong, but I thought it was kind of funny to see the T.V. shadow “run away” from as you drive over water. Microwave up some popcorn and enjoy this video! P.S. Ignore the UI – none of the UI for the planetary disembarkment has been done, it’s just displaying the normal in-space UI. Also, the “popping” that you can see in the distance sometimes is something that will be fixed. Ok Here we go. I like what I seen so far. Here are some things I like, noticed or would like to see. 1. The TV body tends to sink into the ground depending on the terrain. I notice that I see little suspension play and no ground give. 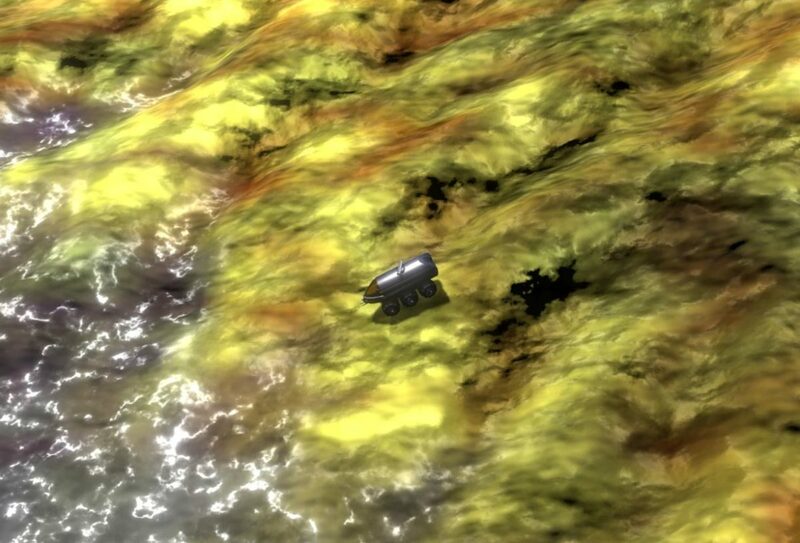 So it appears that the collision surface is under the actual surface of the terrain. Both the TV and ground should show signs of giver depending on the terrain. The suspension should move more and the ground less on hard terrain. The opposite holds true in mud. 2. There should be a bow wake in water and tire tracks where the TV has been on land. These of course can be effected by snow or rain or other weather that would obscure the tracks. 3. In the future when it is time to collect minerals, you should considered using s mineral scanner like the Sega version. I always thought it was dopey to have minerals just lying on the surface. 4. How do you plan to implement fuel efficiency? Will crew skill and terrain dictate this? I think TV piloting should be a skill requirement. Experience and training will allow for better fuel efficiency on top of add-ons. 1. It’s hard to see the suspension move when the TV is tiny on the screen – up close you can see it move a lot. Not sure what to do about that. 2. Good idea – can you post this in the requested features thread on the forums (click on “community” in the menu bar)? I use that to keep track of what people want. 3. I’m leery about changing gameplay mechanics too much from the original for the initial iteration of the remake. But as an add-on that would be a great idea. 4. Terrain will dictate fuel efficiency like in the original EGA game. I don’t remember crew skill having any effect (I could be wrong). You should put crew skill affecting TV efficiency in the feature request thread too. I just found a bug with the TV where it was calculating the attitude of the body based on the front wheels and the middle wheels, instead of the back wheels. Fixed. Now the back end of the body doesn’t sink into the ground as much driving through those tight dips. Thanks, that’s what I was referring to.